The whole circus moves forward from the Netherlands to Schleswig-Holstein, Germany. 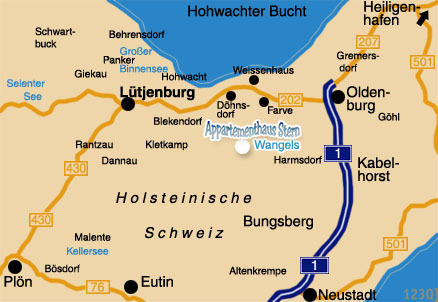 The GTS community will meet there in Wangels, a small town near Oldenburg/Holstein. Beautiful beaches are only 5 (motorcycle riding) minutes away. In and around apartment complex Stern will be the gathering in a big marquee. a big field near the apartment complex is at our disposal. Sanitary facilities of the apartment complex are at the disposal of the campers. Apartement per Person 98 €uro. Camping per Person 58 €uro. 1 x barbeque complete with all trimmings on Friday evening. 1 x „Holsteiner Buffet“ all kinds of meats and fish. All further costs like; permits, camping-ground, etc. Of course all (moderately priced) drinks and food during the tour are separate. So is the petrol of course!!! The lunch during the tour will be at a cafeteria. The tour is planned so that we will be back around 17.00 hours, this will give you the possibility for a visit to the beach. If you make a booking at the apartment complex or for camping, please make sure you mention you are there for "GTS 1000 Meeting 2007". All bookings direct to apartment complex Stern, all you have to do is call..
Sandra, the landlady, will take care of everything. Staying in the apartment complex before and after the meeting is possible at regular apartment rate and availability. Try to book in groups to make sure of best possible use of each apartment. In Wangels: follow the main road. Because of experiences made at the last meeting, where many registered, and didn’t show up, the organisation has decided that all registry fees must be paid up front. This to ensure that all costs made by the organisation are covered. As always, all proceeds of the meeting will go to a good cause. GTS Meeting registration page link below.